The only tool you need for transforming long, complex documents into highly formatted and visually rich publications. 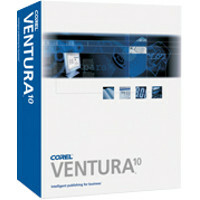 When it comes to business publishing, Corel Ventura 10 is as powerful as it gets. It's the only tool you need for transforming long, complex documents ? including XML files ? into highly formatted and visually rich publications. Enhanced stability and compatibility keep your workflow smooth, while powerful formatting tools help ensure polished documents. Update multiple tables quickly with new table tags. Enjoy more flexibility with XML import support. And work faster with improved PDF and printing options.